Photo credit: PanelClaw’s Polar Bear Mounting System and project developer Nexamp. 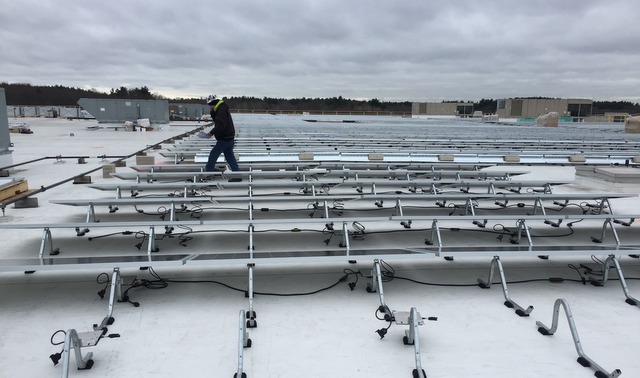 Installing a ballast racking system on a commercial roof isn’t necessarily any easier or more difficult than a ground-mount in terms of the planning and challenges, but you can’t accidentally void the earth’s warranty. There’s also less risk in a ground-mount mistake resulting in a PV system tumbling into a parking lot or street. 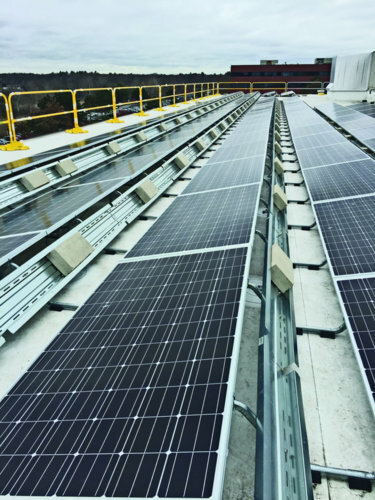 Best practices for installing a rooftop ballast system begin with accounting for these factors. That roof has a story; it exists within context. The age of a building will reveal the building code it was designed to, which then reveals the additional capacity — and how much load a roof can hold is the determining factor in knowing if PV is an option. The time period in particular that worries Worden are buildings 15 to 20 years old. “If they are 5 to 10 years old, they are probably OK.” But then again, some older panelized wood roofs have to be evaluated carefully. This isn’t to call out building engineers; they have their own economic factors to consider, and 20 years ago, the wide spread adoption of commercial rooftop PV wasn’t part of the decision-making. In 2016, those considerations are changing. California building codes highlight a particular conundrum concerning ballast systems. California is the mecca of PV in the United States, but it’s also the mecca of seismic activity. This leads to both stronger roof codes and more caution, and the code itself isn’t completely clear on what to do with ballast. This grey area is just now starting to color in. “It’s amiss that people think they aren’t allowed to do ballast in seismic areas and that you have to attach,” says Rob Ward, head engineer at SunLink. Ward is part of a committee to make the code clearer. “Some jurisdictions have been resistant, saying they will not allow ballast systems on the roof because they are too dangerous. SunLink has done a lot of testing, so we said here’s the analysis and the truth to it: it’s safe, and it can be allowed.” SunLink became the first company to install a ballast system in LA County. Many of the top mounting/racking companies are similarly involved in working with codes and standards bodies across the country to get everyone on the same page, which is part proving the point that ballast is safe, and part promotion of the standards that make up a quality, safe rooftop ballast system. To that latter point, code considerations are intimately linked to the systems selected — have those systems been tested? Will they stand up to scrutiny and the elements? PanelClaw, which is solely focused on rooftop ballast work, is dedicated to spreading this message, from the new SEIA committee, to the structural engineers of California (SEAOC) to the ASME. In general, getting out to the site and physically seeing the roof is the most important step. On the one hand, it is the easiest step – just go and look. But in a competitive job-bidding environment, this step is often put off until later in the process. There may not be a way around it, but this workflow will naturally lead to revisions of initial designs in the best of scenarios. Google Earth will only get you so far. There have been many times where AET has delivered product to the site only to then hear a structural engineer say the roof can’t hold what’s been spec’d out. “The initial design can change, so it’s up to us to work with the customer to design the system to optimize or minimize cost and loading,” Faust says. This is where choosing the right mounting company for the job could pay off with additional services, such as site surveying and engineering. Bottom line, no rule of thumb will be the key to judging a roof, so every job needs a building engineer to look at the roof on site and at drawings of how the building is framed. OK, I’m on the roof — now what? Nicolaou says start with your setbacks from roof edges and then map the obstructions for shading. Look for fire code or walkway considerations. Get underneath and check the roof membrane. What is the roof composition? Do its chemical properties clash with the racking materials? A limiting factor to consider is pitch. Nicolaou looks for 5 percent pitch or less. “Beyond 5 percent, up to 7 degrees, you’re looking at a combination of ballast and attached or just fully attached,” he says. Next, are there parapets? These are the short walls around a roof’s edge, and they have a big impact on wind. We will get to them in a minute. Understand the roof’s drainage. Extra dead load on a roof will cause some additional deflection of the roof framing. “You may be trading off some of the roof’s live load capacity to take the extra dead load of the array, so ponding and drainage are more important and need to be looked at by the building engineer,” Ward said. Software can play a big role in your system design. PanelClaw, for example, developed a partnership with PVComplete to have its system geometry preloaded in the software. Once the roof is mapped, the software allows you to superimpose multiple tilt angles, configurations, row spacing and string options and then compare them all side by side. Back to those parapets. Even though they look like walls, and walls theoretically obstruct oncoming elements, parapets have the opposite effect on wind. A small, high roof with parapets is going to really test the stability of your install. There could be 500 lbs of uplift in the corners but only 50 lbs in the middle. This informs how much ballast you need and where. The same calculations made to adjust for parapets need to be applied to wind deflectors. Comprehensive wind tunnel testing will reveal a lot of these nuances and how a mounting system will respond. These reports start the plan of attack against wind, but more expertise is needed on top of that spreadsheet. As noted earlier, the permitting in seismic zones has been changing the last few years. Ward says there was always prescriptive language that systems in high seismic zones need to be attached to the building. That language wasn’t thinking about rooftop solar. Ward worked with the Structural Engineers Association in California to put guidelines out for unattached rooftop arrays that accounted for safe performance and met the building code. In high seismic zones, you need a buffer around the array to account for potential displacement in the event of an earthquake. Once you are ready to install, the job is all about efficiency while staying flexible. For starters, Faust and Ward both recommend getting as much done on the ground as you can before heading to the roof. These are system dependent, but can include stuff like preassembling columns, prepanelizing modules or premounting modules in groups offsite. On the roof, how efficient are you being when placing panels? Will panels in certain areas mean more components or weight because of your design? Faust recommends building a couple rows before putting panels on to allow for adjustments. Wire management is usually simpler with ballast-only, but be sure to have that figured out ahead of time. Factors that could make wiring more difficult include racking with sharp edges or less than 2-in. clearance under the panels. A lot of efficiency onsite is determined by the system you choose. Some may involve fewer components; some may have more preassembly; some may provide more flexibility to adjust for last-second surprises. If you have enough knowledge about the roof, selecting the right system will be much easier.